I am not much into colourful furniture but I do love this red Eames chair in the picture above (which I found on Bolig Magasinet). Modernica is a great source for vintage Eames furniture. All chairs in the image above are from Modernica. You can build your own fiberglass chair on their website. I love the look of one of these colorful chairs in an otherwise white room. Great ottoman in the pic! I love this interior! The chair looks great! The interior looks great, but that’s mostly because the cushions and the matching other ‘chair’. Can you give me more details about this cross-stitch embroidering thing? This is absolutely an interior I love, specially cause the basic is white with colorful details in the accessories. It could be my house! 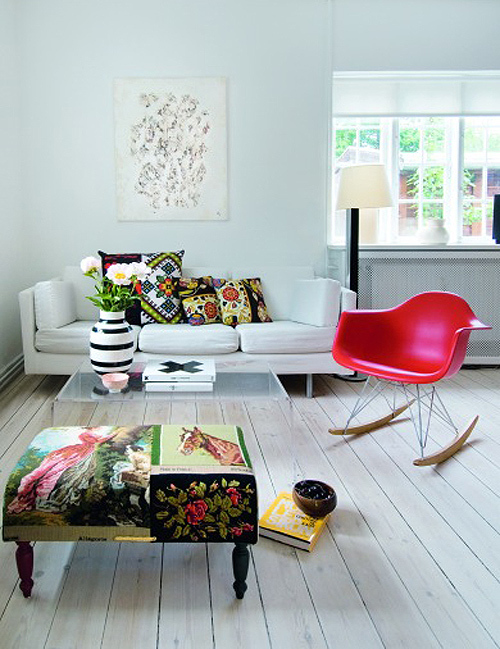 I’m not a big fan of Eames rockers (I prefer the DAW) but those embroidered cushions and the footstool are FANTASTIC! Do you know who/where the photo is from? What a great room, I absolutely love the ottoman and the cushions! Modernica’s knockoffs of real Eames designs– Modernica’s environmentally unfriendly fakes– have no place on a serious design blog, or in a serious person’s home. There is only one source for AUTHENTIC Eames chairs, which happen to now be 100% recyclable, unlike the environmentally unfriendly Modernica fakes. 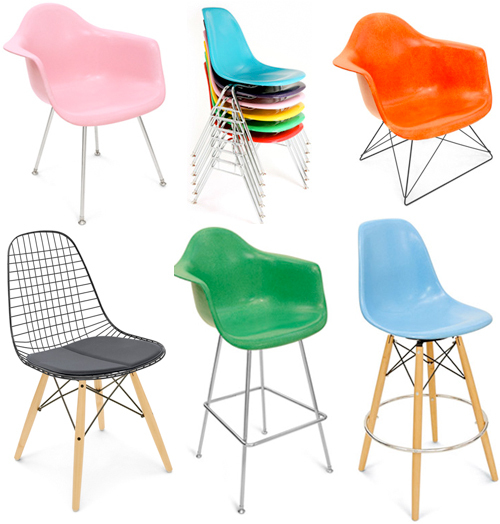 You can also buy authentic Eames designs at Design Within Reach.